For the historical province, see Dalarna. In older times, Dalarna was periodically part of the territory ruled by the governor of Västerås Castle. The 1634 Instrument of Government led to the creation of a county covering Dalarna with its own County Governor. The Kopparbergs län (literally Copper Mountain County) was finally created by royal decree in 1647. 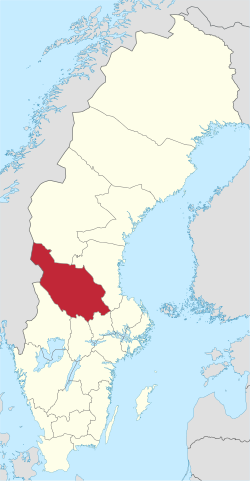 In 1997, the name of the county was changed to Dalarna County. The main aim of the County Administrative Board is to fulfil the goals set in national politics by the Riksdag and the Government, to coordinate the interests and promote the development of the county, to establish regional goals and safeguard the due process of law in the handling of each case. The County Administrative Board is a Government Agency headed by a Governor. See List of Dalarna Governors. The County Council of Dalarna or Landstinget Dalarna primarily handles health care and public transportation. The Dalarna County inherited its coat of arms from the province of Dalarna. When it is shown with a royal crown it represents the County Administrative Board. 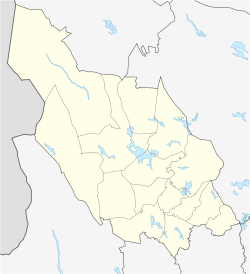 Wikimedia Commons has media related to Dalarna County. Wikivoyage has a travel guide for Dalarna County.